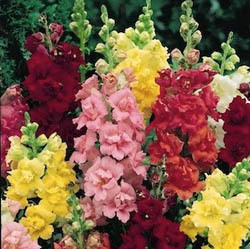 Why oh why is there the general reluctance of people to plant Snapdragons? Saying things like "I dislike planting annuals" but then happily plop in a petunia; which is, yes, an annual. So here I go again trying to convince you all that Snapdragons are a wonderful plant for the garden. Prepare to dazzle your friends with this wonderful and award winning annual. Strong growing and vigorous it bears fully double blooms in a range of lovely bright colours and which are more like a double azalea than your average Snapdragon. If you prefer the traditional snapdragon face, well we have those too, but Madam Butterfly Snapdragon has an open face which makes a beautiful full cut flower. And this plant loves to grow in filtered light to hot sun and will bloom long after all other annuals in the garden are finished by frost. Incidentally, did you know that Snapdragon is also a Scottish Christmas game of plucking raisins from a dish of burning brandy? Sounds Fun! Ouch! One of the most outstanding container plants! The unique variegated foliage of Ascot Rainbow is phenomenal in any sunny container from the moment you plant it until the hardest of frosts in September. It was selected by an Australian grower for its amazing variegated leaf and flower (bracts) colour. Narrow grey green leaves have a striking yellow edge. 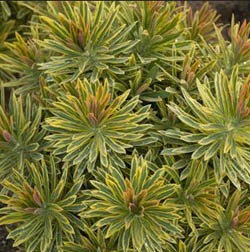 The foliage is topped by clusters of lime and cream variegated cup-like flowers. As fall approaches and the days get shorter, the leaves turn a most beautiful soft pink, making a gorgeous display. So what else makes this a winning plant? Deer and rabbits don't eat it, it loves the hot and drought, sturdy stems can take the down-pour of rain and the battering of a hail storm. Even though it is not hardy here in Southern Alberta, you can dig it out of your containers in the fall and plant it in B.C. at the cottage, your mothers, or a friends garden; they will love it too! English Mint is a staple of the home garden, offering ease of cultivation, versatile flavouring for the cook, and home remedies for everything from hiccups to upset stomach. A vigorous and undemanding garden dweller, mint will quickly make itself at home in part shade given moist, well-drained soil. A lush, compact plant that does well as an annual plant in containers, English mint is sweet, rather than a peppermint. As a companion plant, English mint does well planted with cabbage and tomatoes. 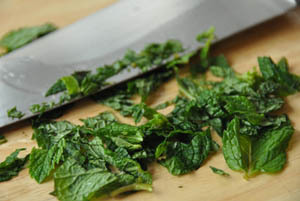 Mint is versatile and lends its flavour to many dishes such as peas, carrots, potatoes and the classic drink, Mint Julep, including the springtime favourite, lamb with mint jelly. If one had to choose one mint for the home garden, this is the one to have. As a side note, when we ordered the original stock plants from our supplier a note attached explained that this plant would not grow in the tropics. Another "good to know moment". In the age of instant gratification, high-tech and time poor homeowners everywhere have cried out for pots that look good, but need no work. 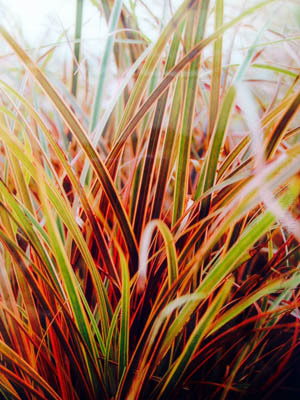 While we can't promise 'no work', ornamental grasses can deliver low maintenance and easy care. This showy New Zealand native grass forms an annual clump of elegantly arching, shiny dark red-bronze leaves with bright cherry red margins. Flower stalks appear in June and July. Well suited to be planted in the sunny containers but will tolerate some shade. Red sedge is already extravagant, but add a twist of colour and you've got a real melodrama. So what happens when you loose your stock plant for of the best selling Bidens and no other supplier can help out? Well you shed a tear and move on. Then out of the blue you find a tiny seedling growing under a bench. Is it the right colour? Will it survive the transplanting? Presto, we are back in business. 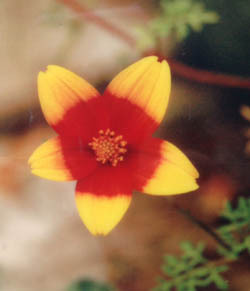 If you think all Bidens are yellow, you will be surprised as this one is a bi-colour. A bright red eye with burnt orange tips on each of the star shaped flowers, set against feathery foliage. This real beauty cascades over the edge of sunny containers and hanging baskets, the stunning flowers look like they are suspended in mid-air by ridged slender stems. The self-cleaning flowers of this plant need little maintenance to keep it looking fresh. Mixed in with red geraniums, Euphorbia Ascot rainbow and Plum Hussy Coprosma you will have containers and pots that will be the envy of the neighborhood. A vigorous climber from Mexico, this much sought after and rarely obtainable, variety with highly fashionable shade of greenish -white flowers is one of the best annual vines we sell. There is a seemingly unsolvable conundrum for the many gardeners among us who would like vertical interest and colour in summer without having to wait a year or two for shrubs or perennial climbers to develop sufficiently to flower well. Cobaea scandens is an impressive sunny location climber and is one of the fastest-growing and most trouble-free vines you will ever grow. 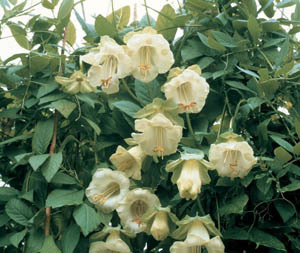 Cobaea scandens alba will appeal to anyone who longs for something with panache and visual impact. It is extremely attractive when scrambling upward through trellis work; it will also solve the problem, temporarily at least, of what to do with that bare wall and will fill the air with a very pleasant honey scent throughout the growing season.